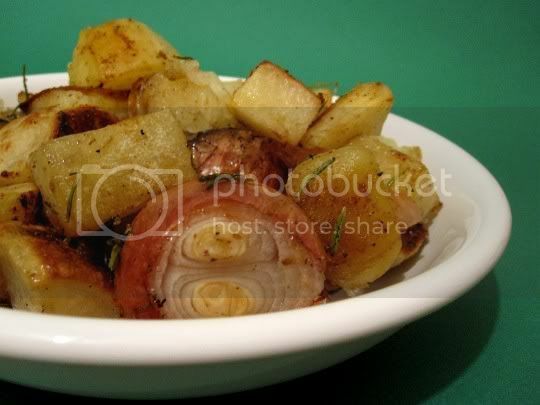 An interesting twist on a typical side dish, potatoes are roasted with whole shallots, garlic cloves, and rosemary. Perhaps the nice thing about this recipe is that most of the prep is only peeling and cutting the potatoes: the shallots remain unpeeled and only have their ends trimmed, and the garlic cloves aren't peeled either. I did think the end result would be strange: are you supposed to eat the skins? This isn't really clear, but I figured it out in the end. Toss all this--plus salt and pepper--in an olive oil-coated roasting pan, and finish with freshly chopped rosemary toward the end of cooking. The aroma as this roasts is amazing...so savory, pungent, and mouthwatering. Total roasting time is about an hour, but I would suggest checking every 15 minutes or so to stir and check for uneven browning. The final step is to broil everything for a few minutes, and this really seals the deal on the crispiness factor. So what about those pesky skins? Well, the shallot skins end up separating from the shallots on their own, and I actually squeezed the soft and chewy roasted garlic "meat" from their cloves. I don't think you should have to squeeze anything in this manner when you're ready to eat, so I WOULD suggest removing the skins from the garlic before roasting. But the roasted garlic pieces with the potatoes are delicious. The shallots can be eaten too, but there was something weird about eating whole shallots. But other than that, the woodsy rosemary was absolutely wonderful with the potatoes, and the whole dish was perfectly salted and peppered. I might even try leaving the potatoes peeled next time. Make again? Yes. Anything requiring minimal effort and resulting in a delicious finished product is a go!